← So Many Books, So Little Time! Aside from the artists, the success of this year’s exhibition rested squarely on the shoulders of the curators. 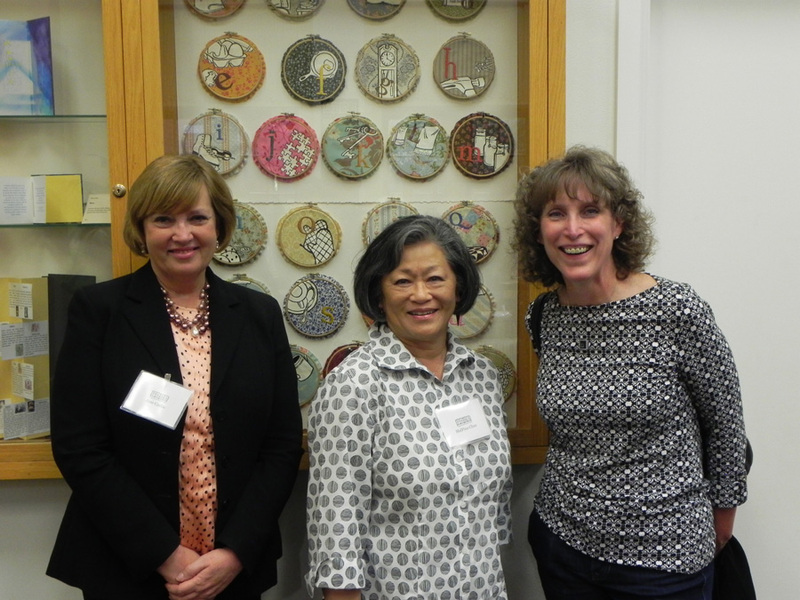 Taking on a vast scope of responsibilities, several months of planning and last minute alterations, the curators who made the 4th annual PSBA Members Exhibition possible were Puget Sound Book Artists, Patricia Chupa, Deborah Greenwood, An Gates, and Elizabeth Walsh. Let it be said, they did not disappoint. 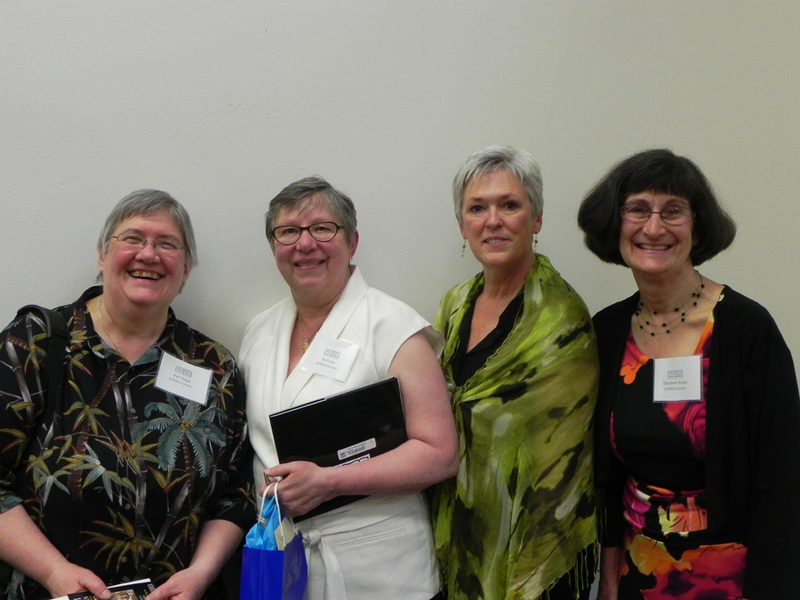 Three awards were conferred last night by the curatorial team of Deborah Greenwood, An Gates, Pat Chupa, and Elizabeth Walsh, and by guest jurors Margaret Bullock, Katie Henningsen, Hilary Robbeloth, Peggy Burge, and Julie Christoph. 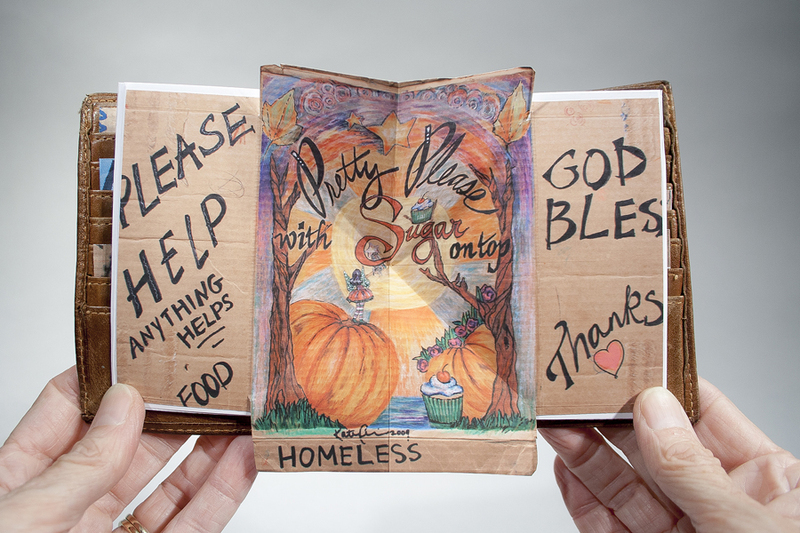 Anything Helps is a limited edition artist book surveying the hand-scrawled cardboard signs used by the panhandlers and Homeless people on street corners everywhere. These folks can be found on city intersections and highway off ramps in cities large and small across the county. It is so very easy to keep driving and avert our eyes as we pass by. Over the last three years I have been collecting these signs, some purchased for $5, some found. Many of the signs are works of art-clever, eye-catching words and illustrations designed to garner our sympathy and our coins as we speed by at 35 mph. I see many parallels between scientists who research GMO crops today and medieval alchemists. To explore these parallels I decided to create a lunchbox for an imaginary alchemist. 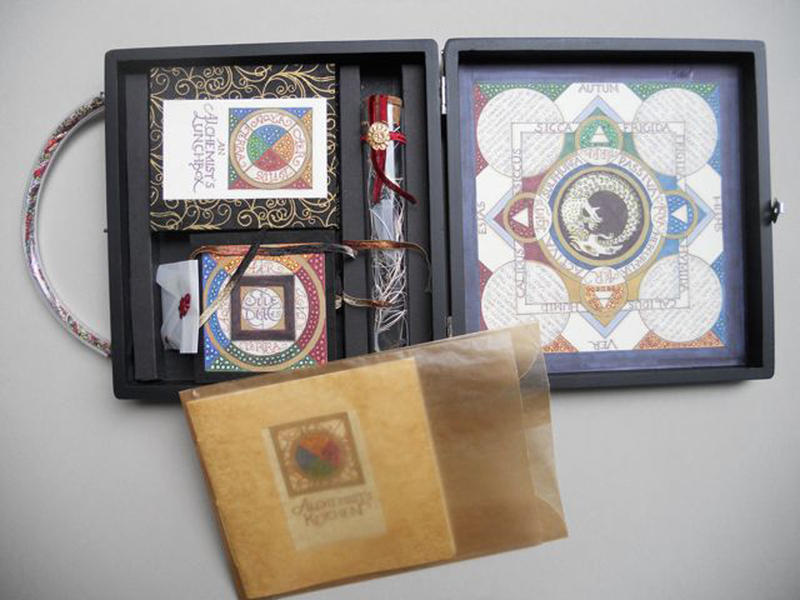 The accordion book combines my interpretations of ancient alchemical symbols and processes with images and information about the most common current GMO crops; including quotes from experts (both pro and con) on the GMO debate. The tulip fold book is a riff on old botanic illustrations with a Frankensteinian twist. The pamphlet book contains my poems, using the four alchemical elements as a starting point. When standing in an old growth forest, you feel a false sense of stability. Beneath your feet are layers o moss, hemlock and cedar needles, lichen cones, fern fronds, and elk droppings. 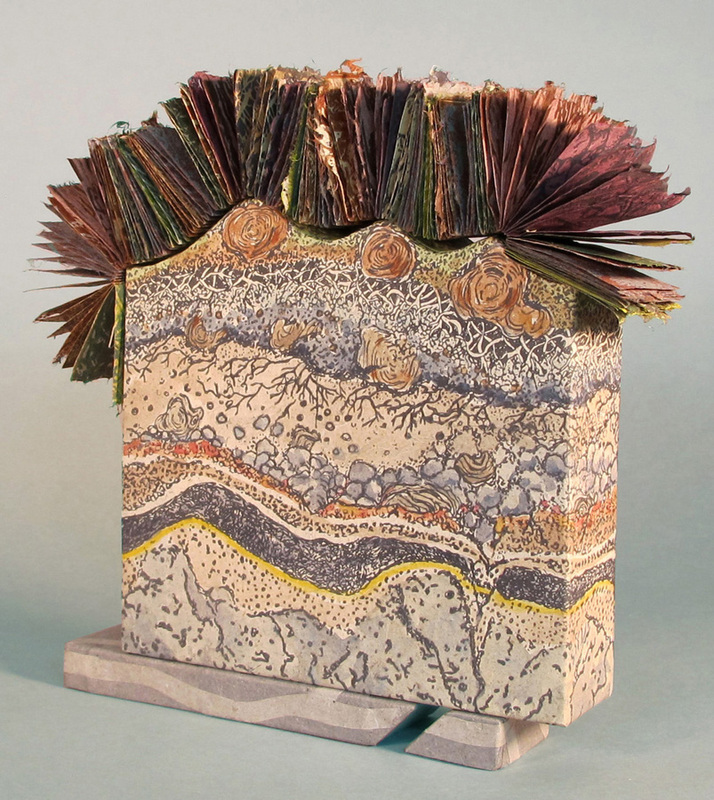 Interpreting the text of a soil profile reveals layers of old growth forests altered by geologic forces: fire, flood, volcanic eruption and lahar. Even the bedrock lies upon shifting tectonic plates. Without the strength of membership, the Puget Sound Book Artists would not be able to attain its mission to further the knowledge, practice and understanding of the art of the book by means of educational activities including lectures, workshops, and exhibits. 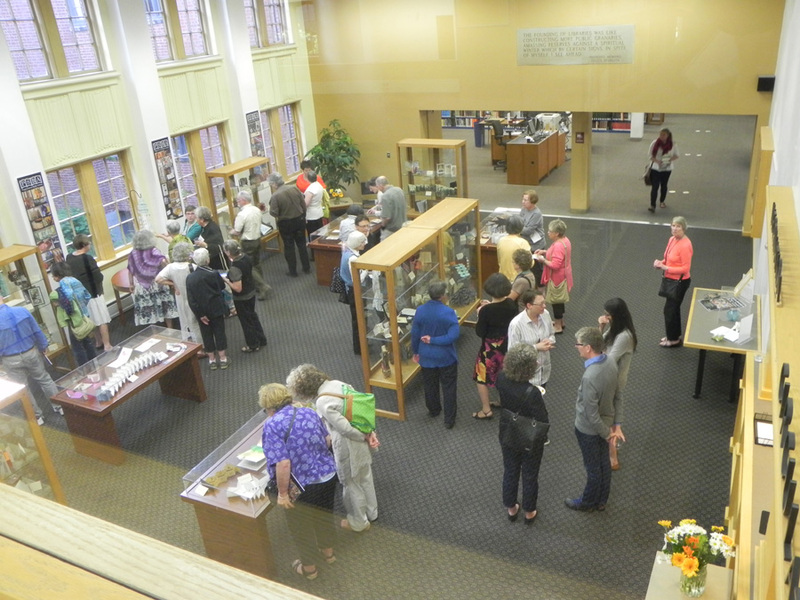 Congratulations to all of the participating artists for a beautiful exhibition and Thank you to the entire membership for your contributions to the organization. We would not be here without you. Below are a few of the photographs taken during the night of the reception, June 5th, 2014. 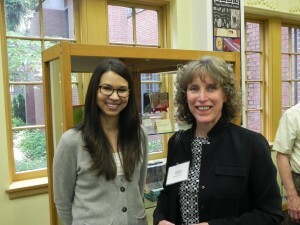 Katie Henningsen (left) poses with Laura Russell, recipient of the Collins Library Award. 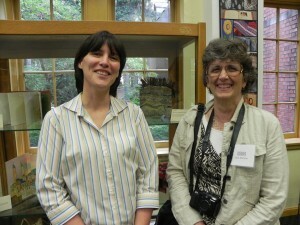 Margaret Bullock poses with Lucia Harrison, recipient of the Award for Excellence. Pat Chupa, An Gates, Deborah Greenwood, and Elizabeth Walsh. 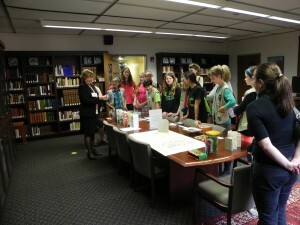 Jane Carlin speaks to a Girl Scout troop in the rare books room of Collins Memorial Library the evening of the reception for the PSBA Member’s Exhibition.